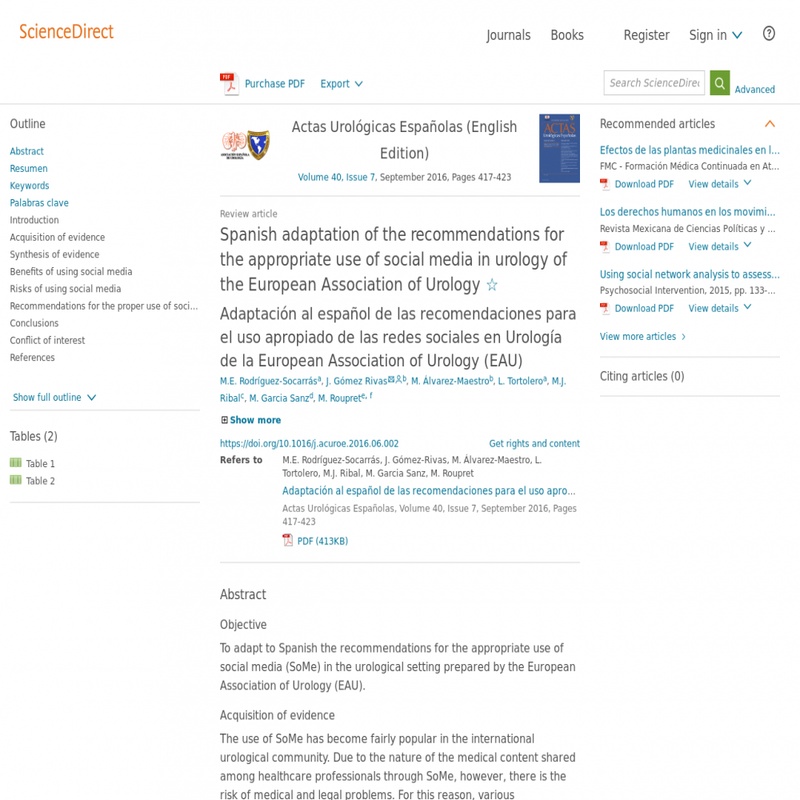 To adapt to Spanish the recommendations for the appropriate use of social media (SoMe) in the urological setting prepared by the European Association of Urology (EAU). The use of SoMe has become fairly popular in the international urological community. Due to the nature of the medical content shared among healthcare professionals through SoMe, however, there is the risk of medical and legal problems. For this reason, various international urological associations such as the American Urological Association, the British Association of Urological Surgeons and EAU have published their recommendations for the appropriate use of social media. Efforts have been made to adapt and summarise the recommendations of the EAU in Spanish and to publish them in Actas Urológicas Españolas (@actasurologicas), the official journal of the Spanish Urological Association (@InfoAEU) and the American Confederation of Urology (@CAU_URO). SoMe include well-known platforms such as Twitter, Facebook and YouTube, which have undoubtedly changed the way in which people communicate and interact. SoMe offer clear advantages for communicating between professionals, working in teams, disseminating knowledge and creating professional profiles and are increasingly used by patients and healthcare practitioners. The introduction of SoMe in the urological community has started a revolution in how scientific articles are shared, how people participate in congresses and how international urological associations communicate with their followers. However, SoMe is generally an open public setting, with potential risks for confidentiality and the doctor-patient relationship due to the nature of the shared information. The present recommendations include tools for creating professional profiles, protecting confidentiality and creating honest and responsible content. SoMe represents a fascinating area for the communication and dissemination of knowledge, with considerable applicability in health care and the urological community. New efforts are being directed to extend the use of social media in the urological community, measuring its actual academic impact and standardising the language employed.